We are set up to test peanuts when you are ready!! So here is a reminder of how to pull a sample for maturity checking. A peanut hull scrape maturity check will be as accurate as the sample that you take. Pull or dig up at least 5 to 6 adjacent plants from at least three representative parts of a field which can be dug in one day. Keep these samples from each area of the field separate. 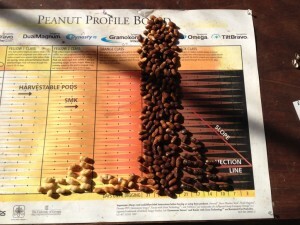 Pick ALL the peanuts off the plants until you get around 200 peanuts (a sample should contain between 180 and 220 peanut pods). Pick the vine clean. If it will be a while before you can bring the sample then pick off the sample and keep the peanuts in a bucket of water to keep them fresh.